This week we made a stop on Baranof Island to check out a little creek that I thought might have some salmon in it. Turns out the coho, or silver salmon were returning to the stream in droves. 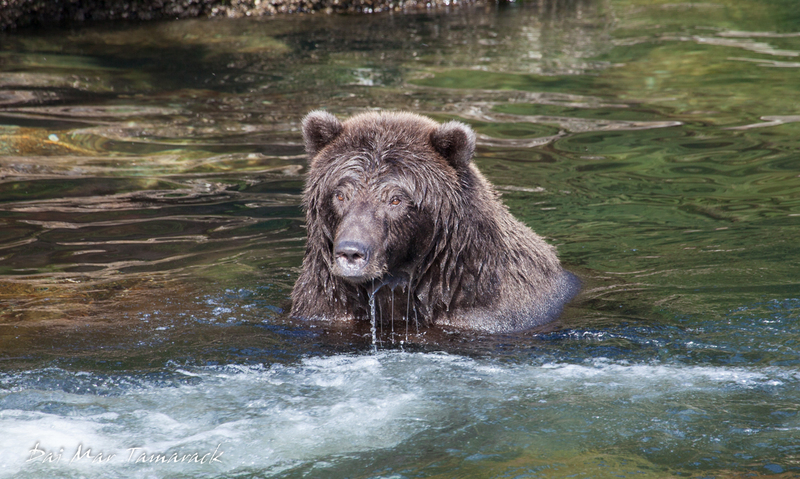 And luckily enough we weren’t the only ones to be drawn to this stream…brown bears were also there. 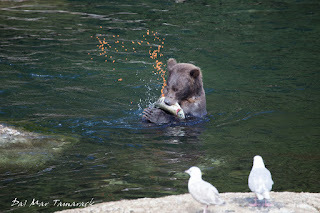 I guess coho is pretty high on their menu because when we first glanced over the stream bank we found ourselves looking down at 12 brown bears. 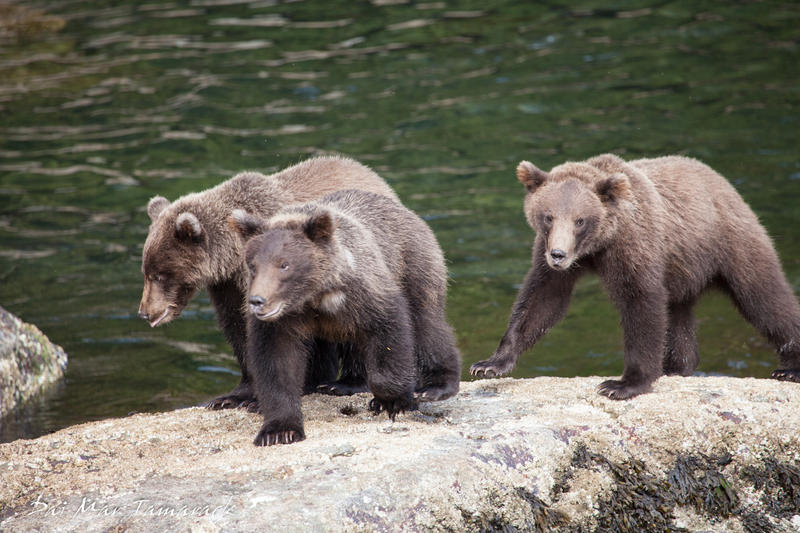 The huge bears were so concentrated on catching salmon that we were able to hang out on the bank without disturbing them. Some of our group were taking pictures and movies, while others were just trying to savor the moment with their eyes and ears. 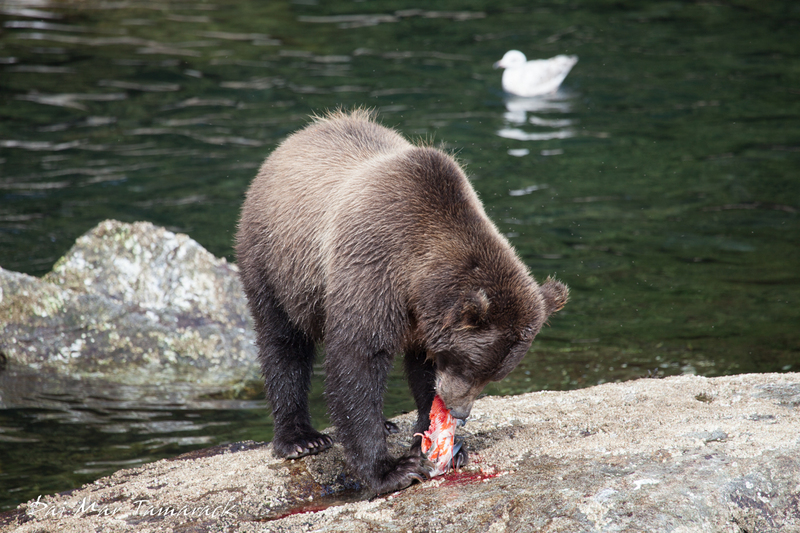 Bears were biting into female salmon sending bright red roe arcing out. 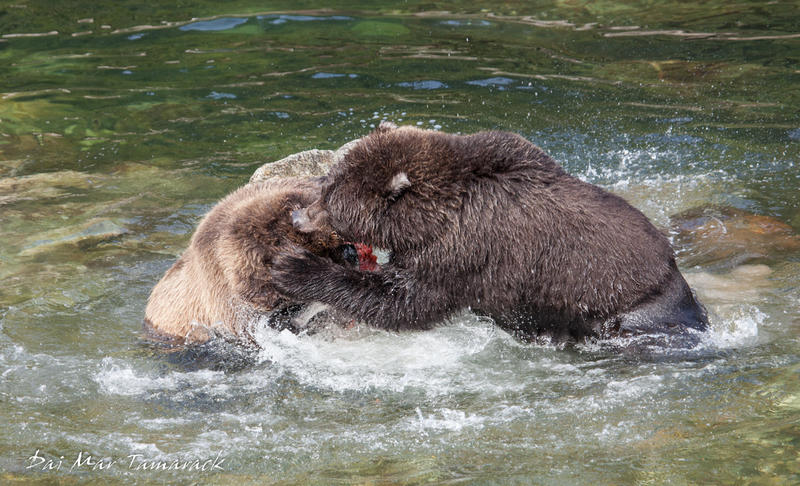 A few times fights broke out between the bears over who gets the salmon. Usually it wasn’t the bear who actually caught it. 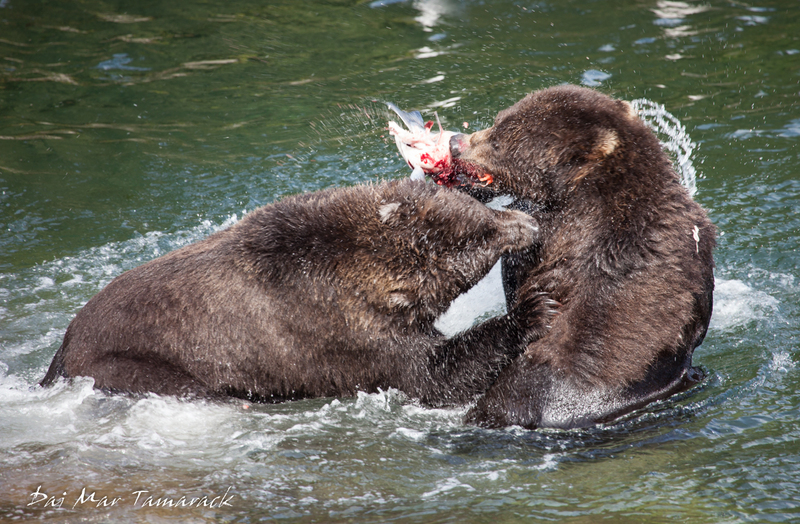 To have all of this unfold so close to us was a true Alaskan experience. To see more of Dai Mar's Alaska wildlife photography click here. 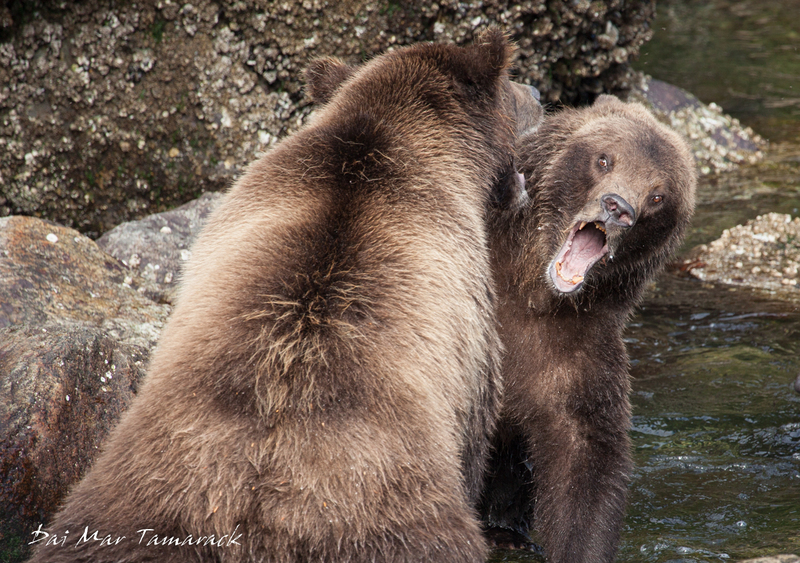 I recently returned to Alaska after some quality family time back East to lead the last few UnCruise expeditions of the season onboard the Safari Quest. 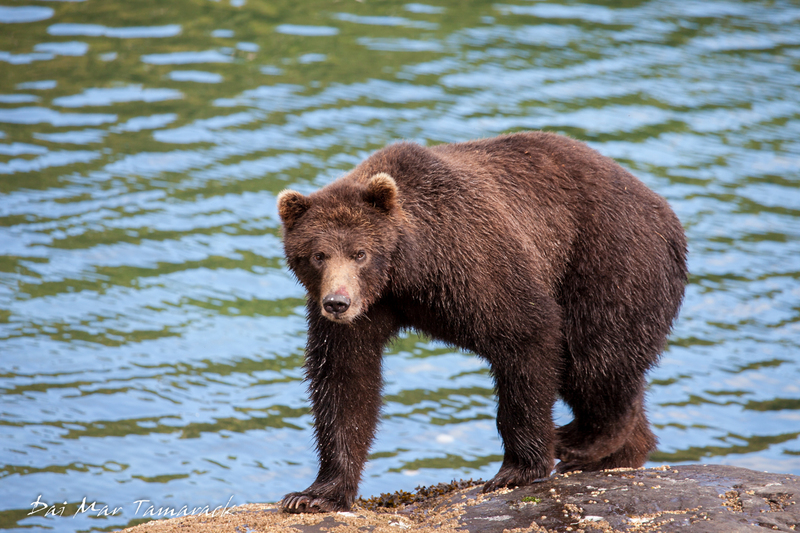 I was excited to be in Alaska at this time of year because wildlife in August can really put on a show. 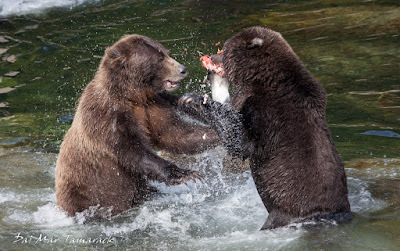 The whales are here in mass, their food being at peak bloom, and the salmon are returning to their streams, which means the bears are gorging on an all you can eat buffet. 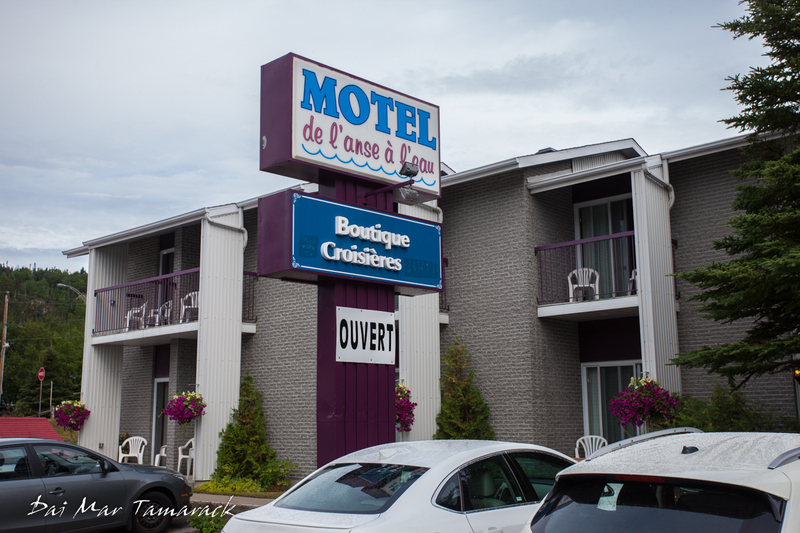 What I quickly realized was that all of the wildlife is really just icing on the cake. 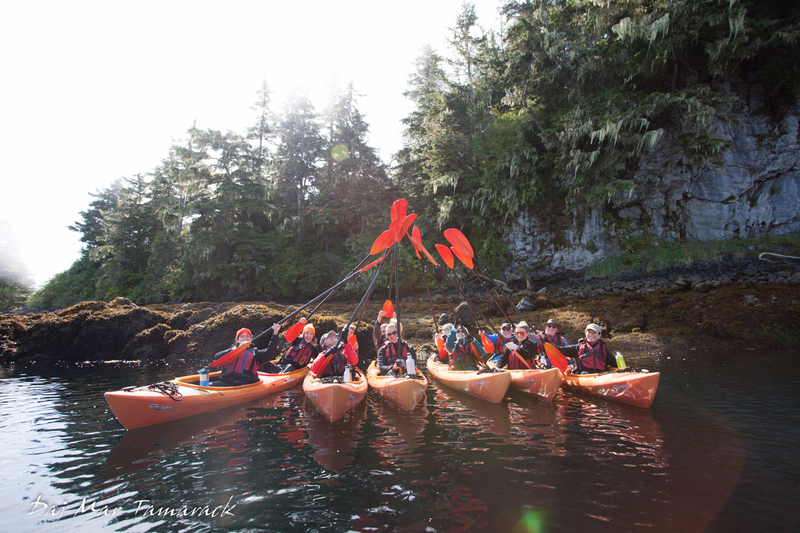 Just being in Alaska, and getting out into the wilderness is enough to satisfy any adventurer's soul. 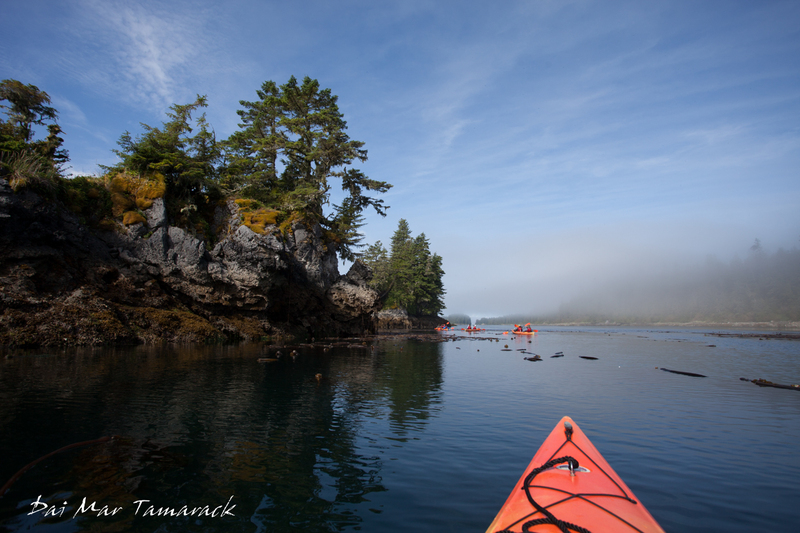 And today's kayak around the Keku Islands was about as good as it gets...and this was our guests first excursion of the week. We woke to an all encompassing fog. 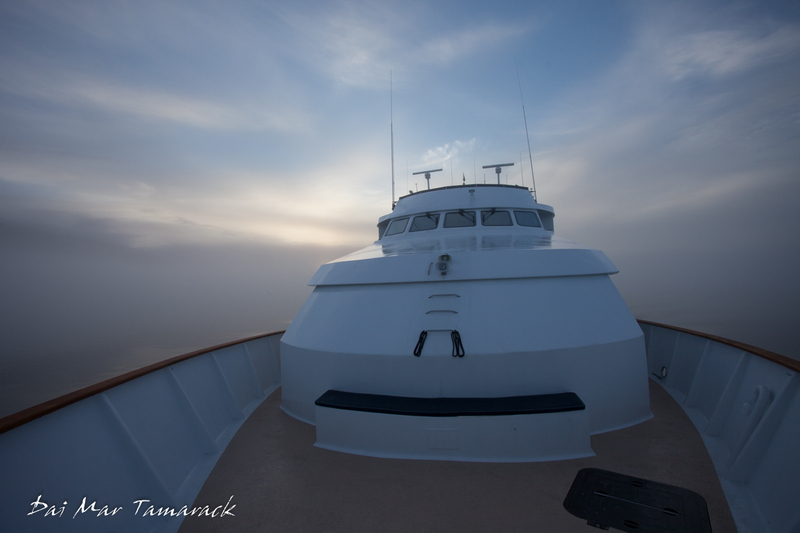 Standing on the bow in the middle of a cloud it has a way of deadening all noise around you. You are forced to be in the present, in your small bubble of visibility. 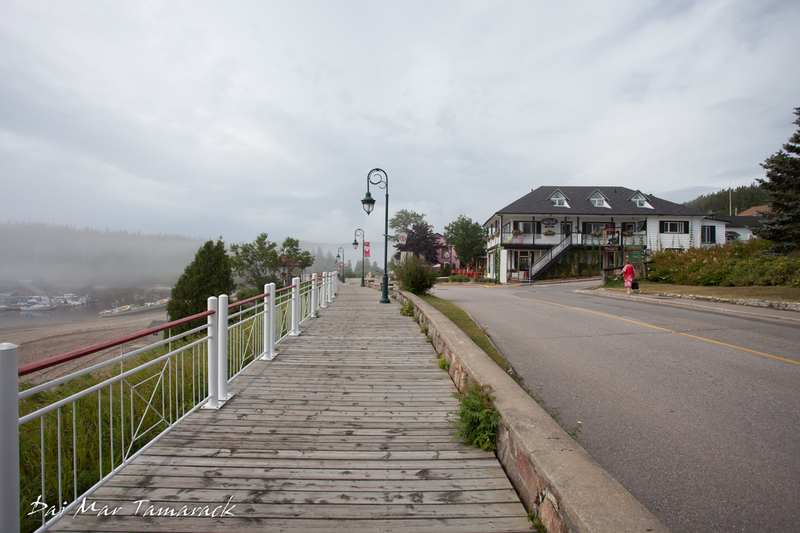 Usually the sun comes out and burns the fog away by the time we set out for adventure, but not this morning. 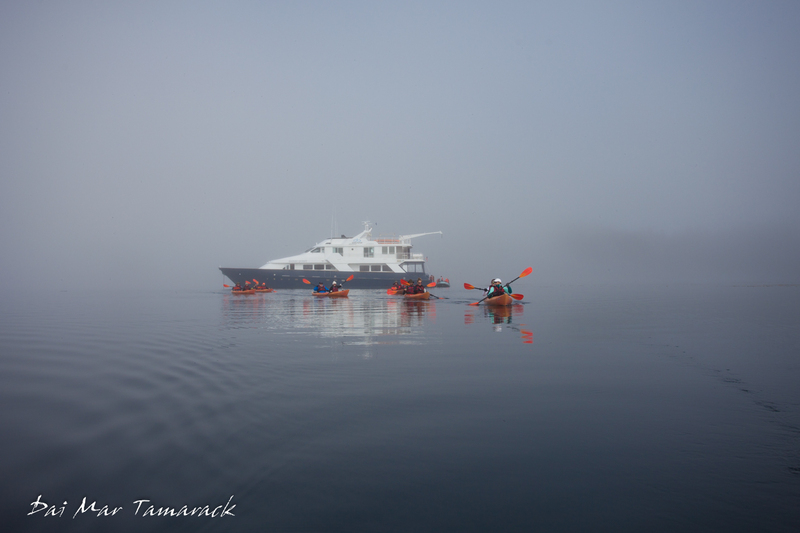 The fog only got thicker as we lowered kayaks and loaded up our guests. The surface of the water was like a mirror, reflections of the kayakers only distorted by the strokes of their own paddles. There was something quite ethereal about kayaking on the mirror-like surface. Forest covered islands appeared and disappeared out of the fog. Luckily I had been kayaking around these islands before, otherwise a gps might be needed to make our way back to the boat. Although the captain did leave the fog horn on so we could listen for our way home. We felt like we were in our own little Alaskan world. The fog started to lift as we neared the end of our kayak trip. I was almost sad to see it go. But with the blue sky also came the thousand different shades of green on the islands. It also gave everyone a better appreciation for just how many islands dotted the landscape here. This incredible adventure was a sign of things to come this week on the Safari Quest. 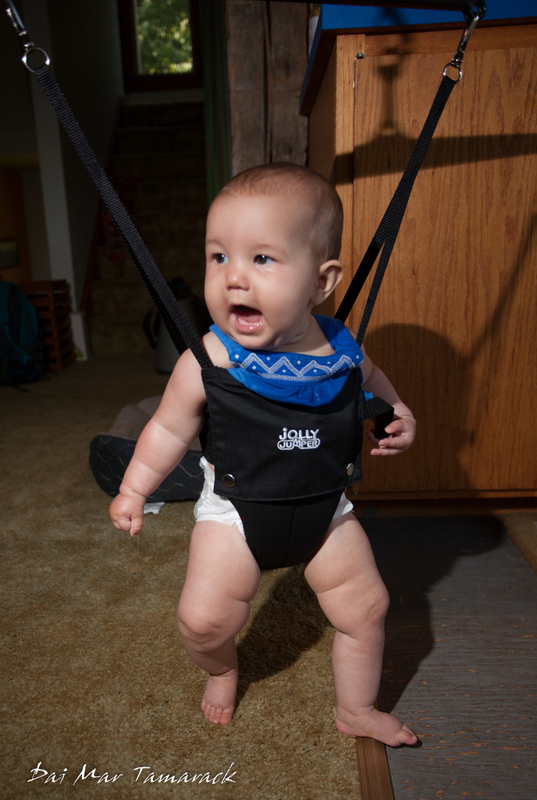 Bears, Bobcats, and Babies, Oh My! 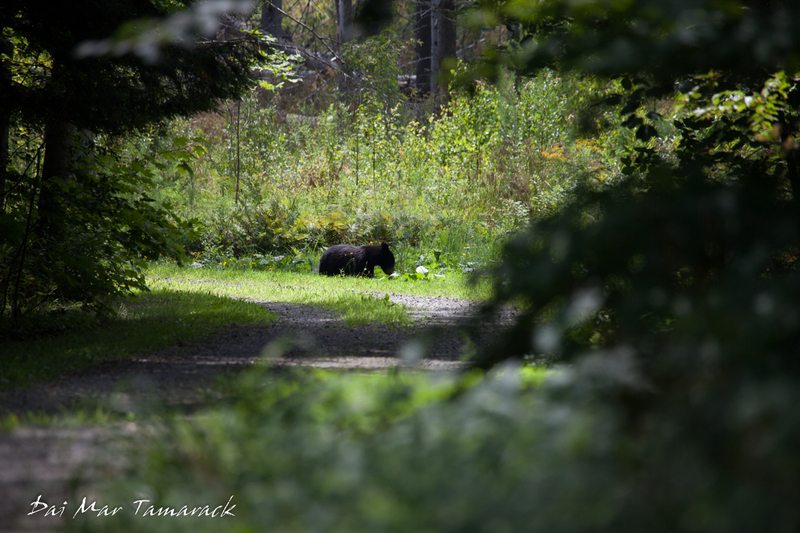 It has been a wild couple of weeks here in Vermont with high temperatures and lots of wildlife. The snakes are out at Stave Island, fawn are running around with spots all over them, a mystery animal on the island, and both monarch butterflies and their caterpillar counterparts have been seen. 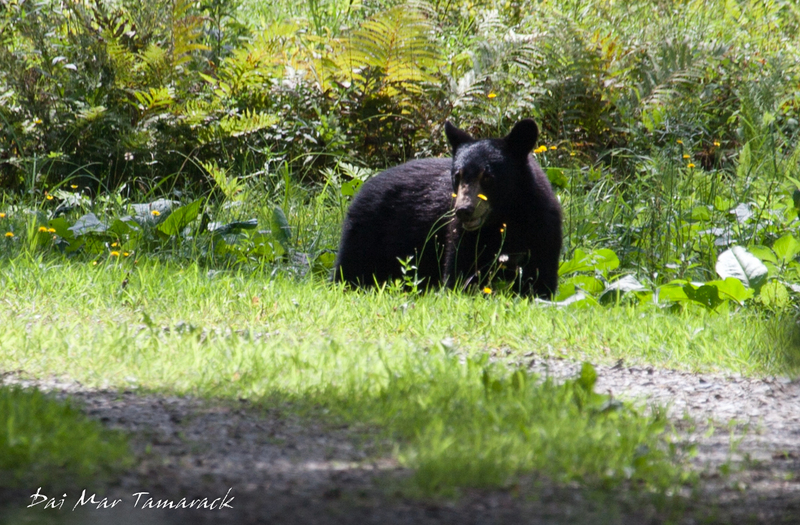 But the biggest wildlife sightings of the summer have both come within the last few days. 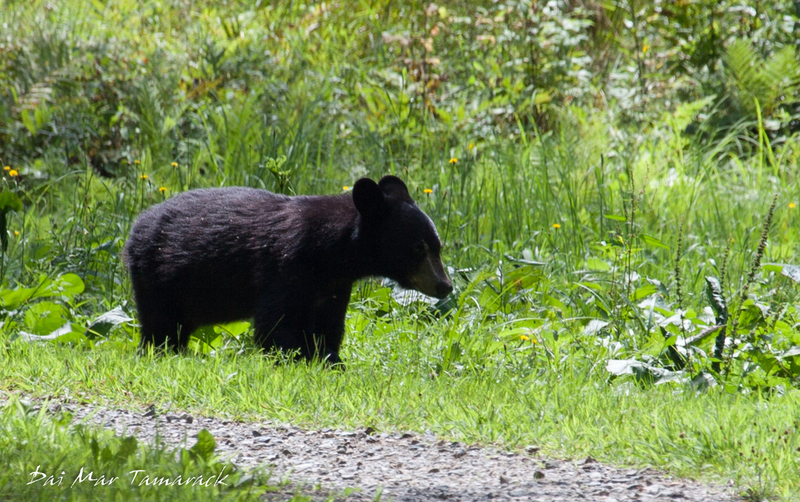 First we had a young black bear sighting right down the driveway. 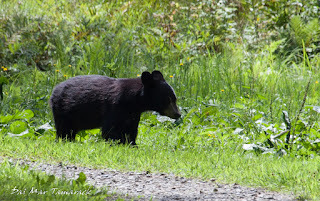 It was munching away on some of the grass and flower in the meadow before crossing the road and darting off into the trees. We figured it was headed towards the berry bushes that have been prolific this summer. We were pretty excited so we grabbed the trail camera and set it up down near the woods hoping to get a shot of the bear. But when we retrieved the camera the next day we were in for shock. We didn't get the bear, but in one night vision video we captured a cat-like creature stalking past the camera. Once the cat comes into full view we immediately recognized the little tail of a bobcat! These are solitary, nocturnal creatures that are almost never seen here. We were thrilled to get a good quality snap shot into the life of this nocturnal predator. And through all of this it wasn't just Heidi and myself taking in all the excitement. We had Catalina along for the ride as well! 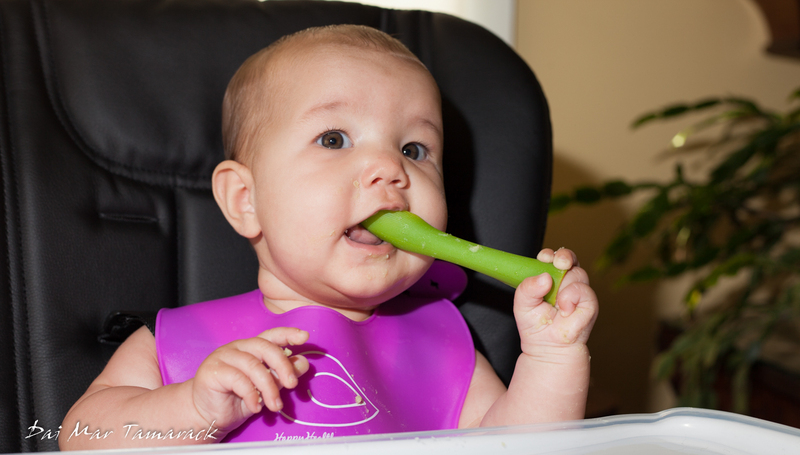 She is six months and going strong. It took me 37 years to get my first bobcat footage. I was pretty skeptical about our chances when we arrived at the harbor and we couldn't even see the boats on the dock. The fog was so intense that we could have played a game of hide-n-seek and the seeker would have had no chance. 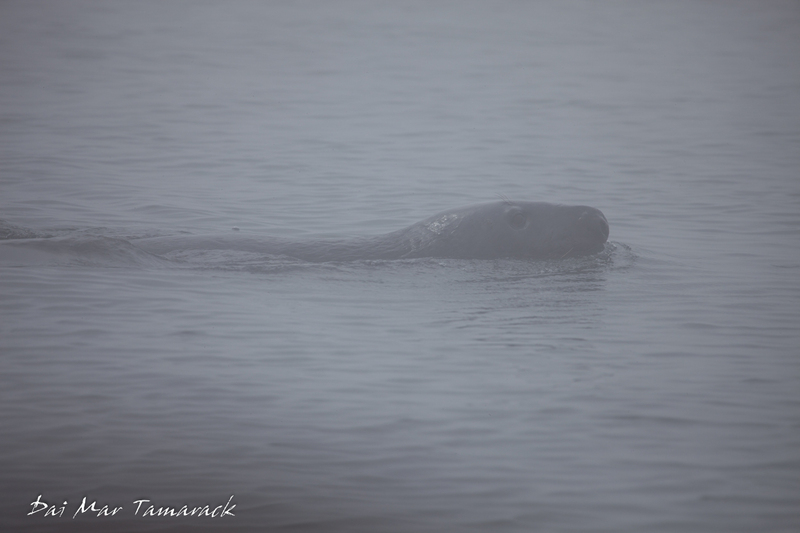 In reality the visibility was about 50 yards, and with the approach regulations inside the marine park being no closer than 200 yards I figured our chances were pretty much nil. But the crew surprised me and with a little help found us some whales! 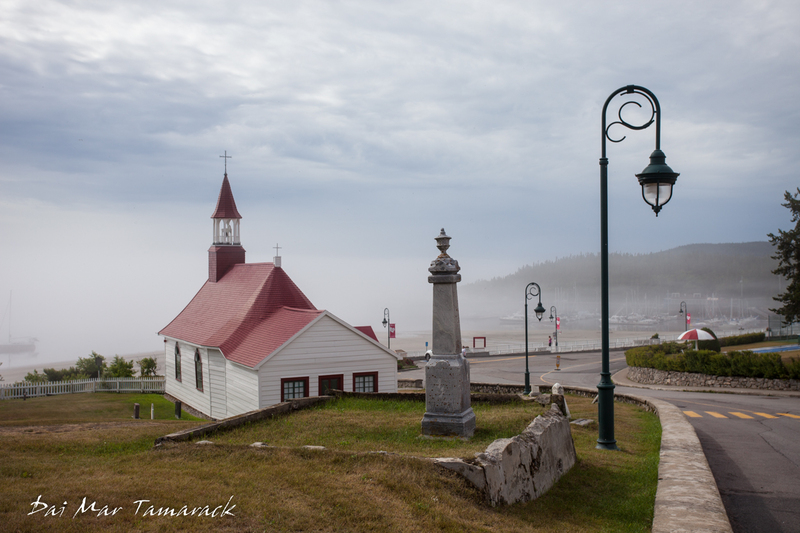 Tadoussac is a tiny town in French Quebec, Canada where the Saguenay Fjord empties into the St Lawrence Sea Way. Its hard to understand how whales are here unless you zoom way out on the globe and see that the whales have an easy opening to the sea. They come here in the summer months for good feeding. 13 different species have been seen here, but I feel pretty lucky to have even seen one of those species on a day like this. About thirty minutes of blasting into the fog we could all start to see that there was no escaping it. The fog wasn't lifting and there were no openings. By this time everyone had gone from being almost too hot on shore to miserably cold and soaking wet. We were driving through a cloud in an open air zodiac. Luckily we had foul weather gear on but it was still a bit extreme. David and I lucked out with the thicker style jackets but poor Lea and Mom stayed tough. At one point I couldn't even see mom's face as she shielded herself against the elements. Our perseverance paid off about two hours into the tour. 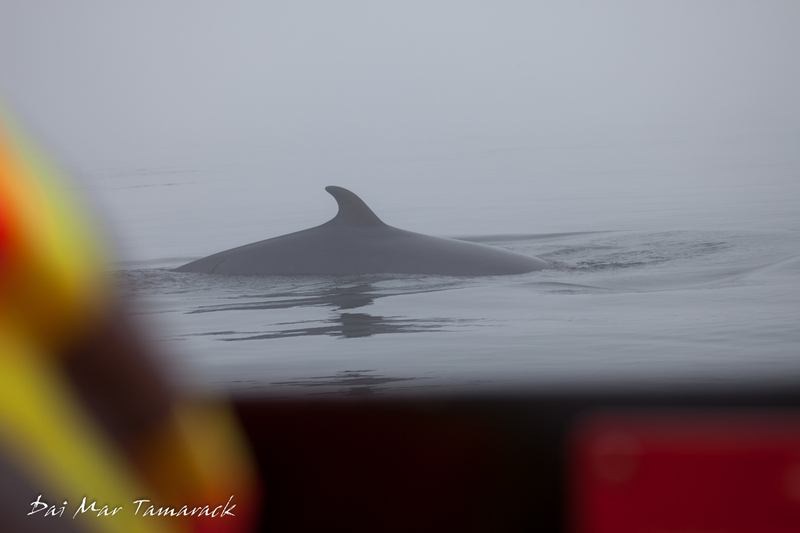 I spotted a minke whale and pointed the direction out to the captain. The whale surfaced again right where I was pointing. I couldn't believe our luck. It must have been about 30 yards away. 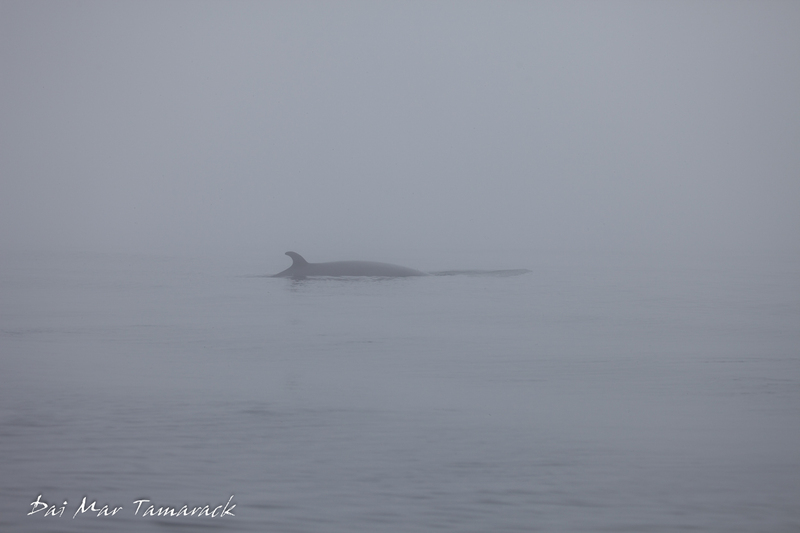 We got a few close looks at our first minke whale before it disappeared into the fog. After this excitement we started coming across more and more life. Birds would suddenly appear above us, and grey seals would plod along. Everything looked much bigger and closer in the fog. It was an optical illusion that made us mistake the seals for whales almost every time. Then we came across two more minkes. We stopped as they quickly changed directions around us. Two became three as we turned the engine off to enjoy. One of my favorite moments of the trip came next. The three whales were surfacing just outside of the our vision but still close enough where we could hear them breathing. There wasn't a drop of wind so the breathing was easy to hear over the silence. Luckily everyone onboard had the same idea to not talk and just take it in. The captain gave us extra time to spend with the whales since it was his only whale watch of the day. 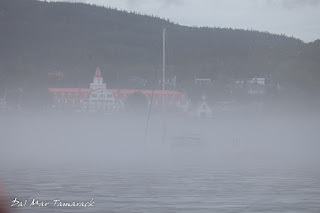 Once we were back on shore we soaked up the warm weather and admired the fog from a waterside tavern overlooking the harbor. You never know what to expect when you are out on the ocean but I always think if you bring the right attitude then nature will provide. 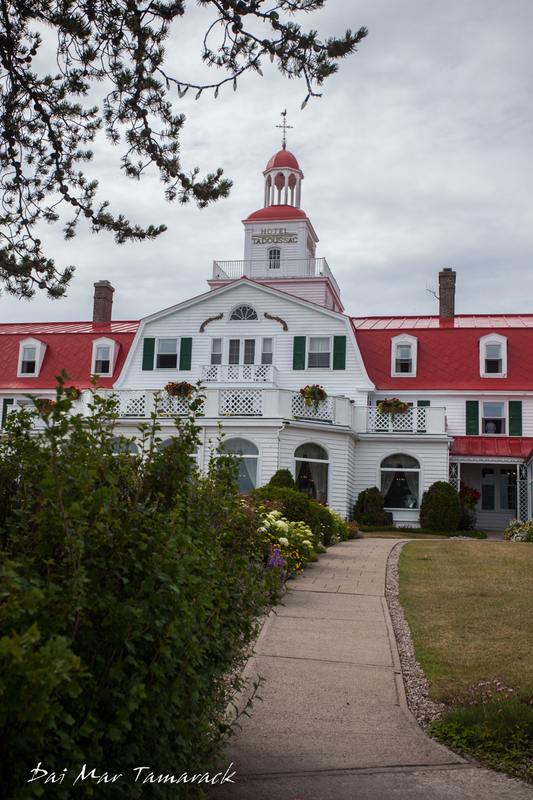 After all my stories of visiting Tadoussac for whale watching in the past, it was about time I take some family up that way. 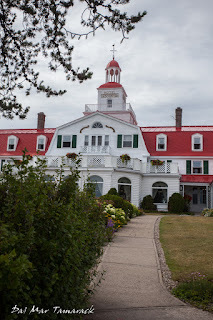 So this past week my mother, sister, and brother in law all made the trip up to Vermont where we piled into a rental car and hit the road for the 7+ hour road trip up into Canada. 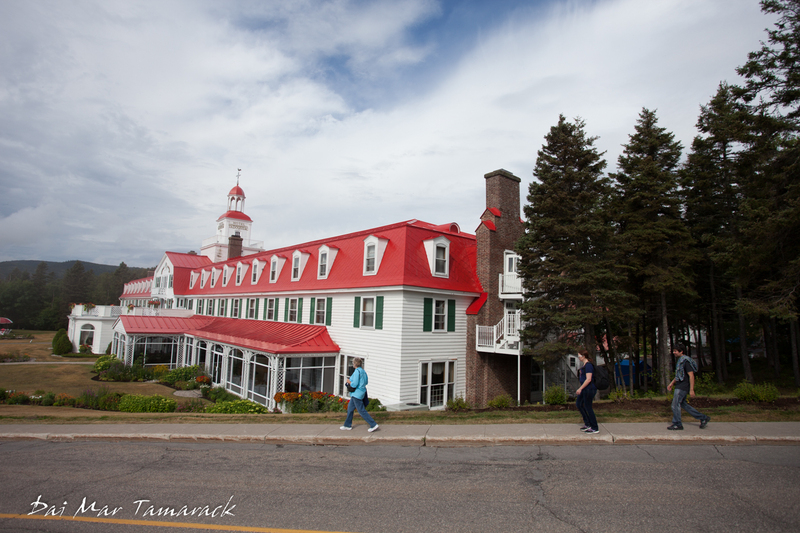 Most visitors to Tadoussac come for the whale watching in the Parc Marin du Saguenay-Saint-Laurent. 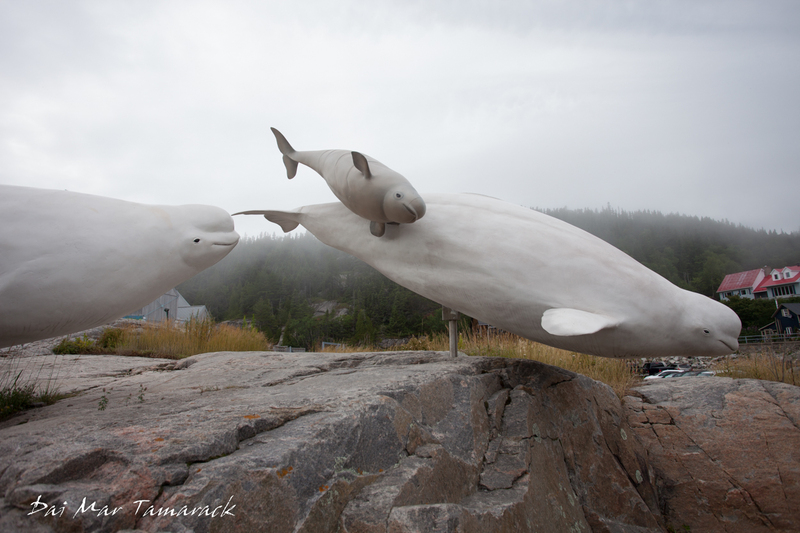 Beluga whales are known to frequent these waters all year round. But in the summer these whale waters really get busy with visits from 12 other species ranging from blue whales, to minke whales, humpbacks to pilot whales. We had a whale watch scheduled for the day after we arrived on one of the zodiac trips so we all went to bed excited, and not to mention well fed on baguettes and cheese. 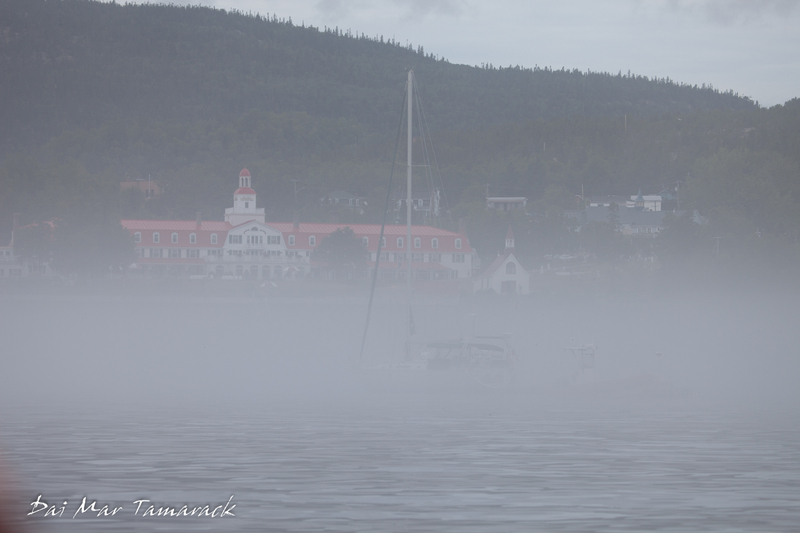 The next day we awoke to impenetrable fog rolling into the ocean front harbor. 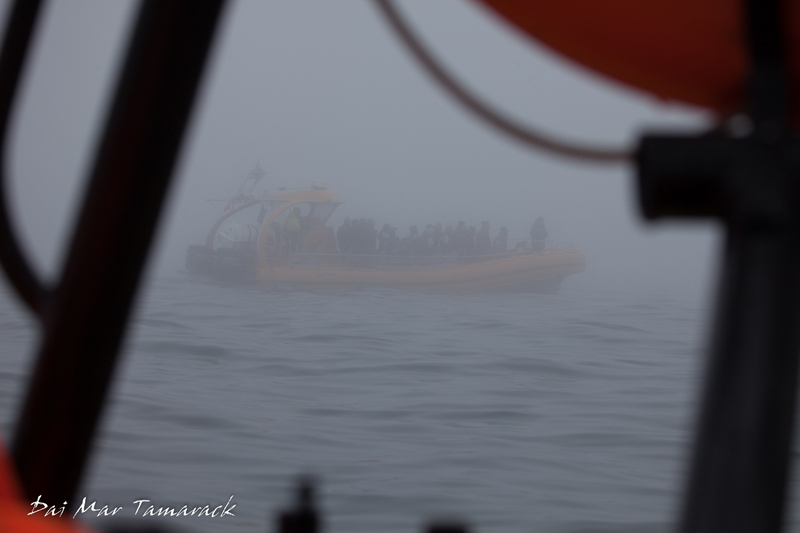 We could barely make out our zodiac at the dock, a few hundred feet into the fog. 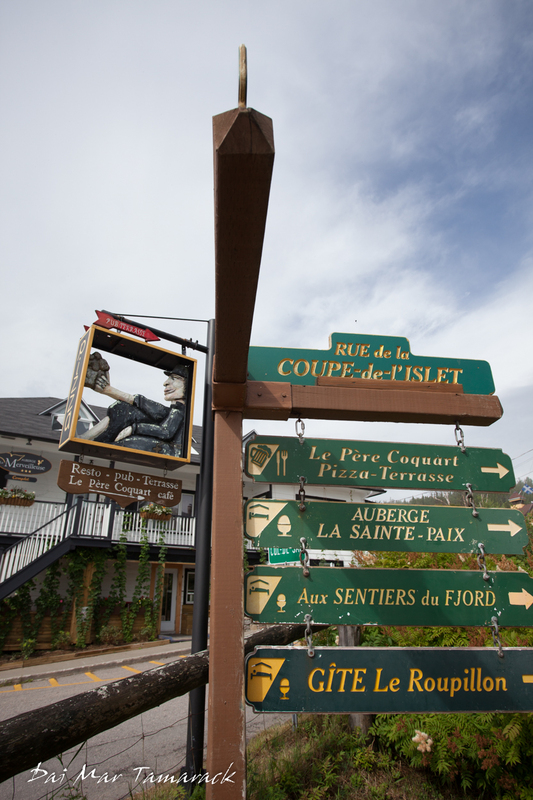 Stay tuned for how things turned out in Tadoussac part 2.